It is no secret that the price of electricity in New Hampshire in relation to prices in most of the U.S. is high. That is true for all types of consumers of electricity, residential, commercial, and industrial, but prices for industrial customers were especially high compared to prices across the country. New England is known for high energy prices but New Hampshire’s electricity prices compare more favorably to the region than they do to other regions and states. 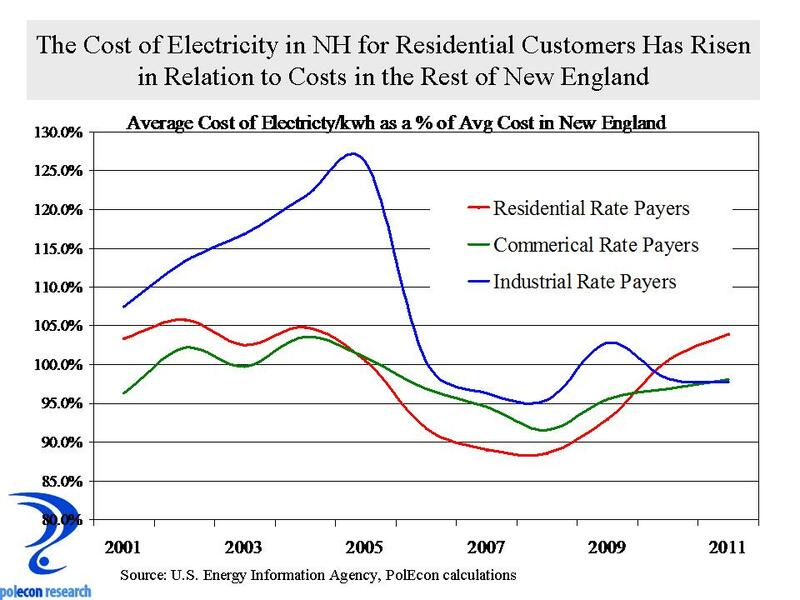 Industrial consumers of electricity in NH, however, seemed to pay relatively higher prices in comparison to industrial consumers across New England. Over the last half of the past decade that changed. Either because of competition for industrial customers, special rates, or other reasons, the relative price of electricity for industrial customers in NH fell significantly in relation to average prices in New England and are now (through 2011) just below the regional average. For residential consumers price trends are different. Compared to the New England average, prices per kwh were relatively low for NH’s residential consumers, but they have been rising and are now (through 2011) just above the New England average. The price competition that has benefited industrial consumers of electricity in NH is likely partially responsible for the rising prices and higher relative prices facing residential customers. Prices for residential consumers seemed to rise more just as prices for industrial consumers fell. As a result, as is being reported in a number of media outlets, competition is becoming more robust in NH for residential consumers of electricity. That will eventually result in lower or more slowly growing average electricity prices for NH’s residential customers. Competition does lower prices but it will only do so for those who actively participate in the competitive market. Just like a car dealer, electric utilities will look for someone to pay the full “sticker price” for every consumer who gets a “deal”. This entry was posted on January 9, 2013 at 1:33 pm and is filed under Electricity, Energy, New Hampshire, prices. You can subscribe via RSS 2.0 feed to this post's comments.